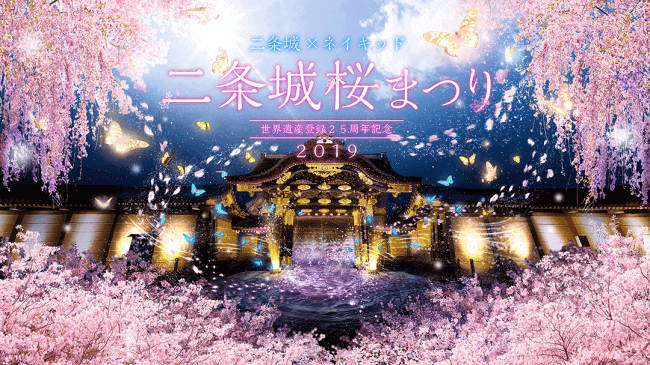 From national holiday Thursday 21st March to Sunday 14th April, world heritage Nijō Castle (Kyoto) is holding a cherry blossom festival to celebrate its 25th anniversary called “Seikaiisan tōroku 25 shūnenkinen Nijōjō Sakuramatsuri 2019”. Last spring, approximately 304,594 people visited the castle during the day and during the night illumination event, making Nijō castle one of the most popular places in Kyoto to watch cherry blossoms. Nijō castle is home to 300 cherry blossom trees. There are approximately 50 different varieties of cherry blossoms and some bloom earlier and later than others. Kanhi-zakura tend to bloom first, followed by Somei Yoshino, Yamazakura, Segakuzakura and Satozakura, meaning that you have approximately one month to enjoy cherry blossoms! For two years now, the night Sakura festival includes projection mapping on the castle gates, illumination on the rapeseed blossoms, and much more! This time the festival space will be the largest it’s ever been. This has been powered up to become an even more enjoyable event. Blue butterflies form on the gate, turn into gold and dance into the castle as if they are bringing spring into Nijō castle. This will be the first time that the small path that passes out of the park of Sakura will also be illuminated. The area before the thin pathway is a great photo spot that visitors can enjoy! This is where the illuminated rapeseed blossoms will be. At Seiryu garden, the illumination suddenly moves when you shine your smartphone light on it, and when you sit on a bench, the trees in front of you will suddenly light up ー this illumination is an interactive experience affected by the movements of the visitors! There are also a variety of other special events such as a live flower arranging performance and a traditional arts performance called “Denraku”. 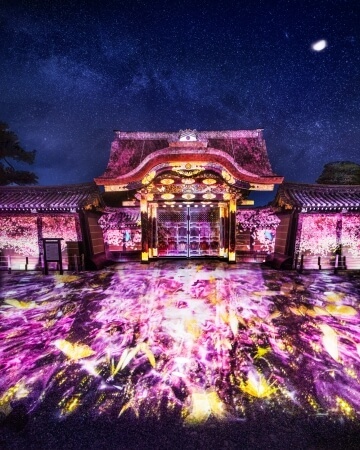 This is a festival that combines traditional and digital art and it is a flower viewing experience unique to Nijō Castle.